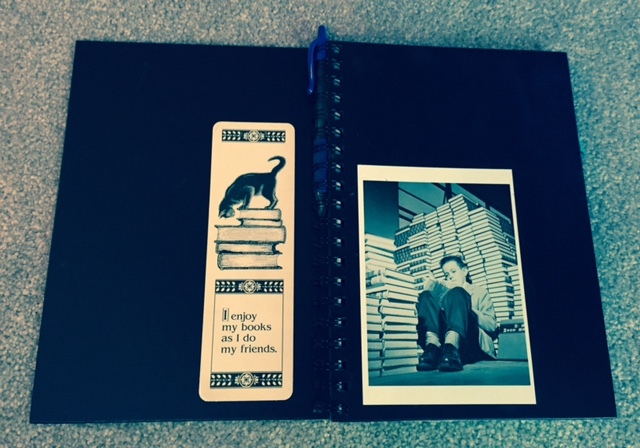 On this blog, I’ve written about journal writing. I’ve written about reading books. There was a time when I did both: I read books and journaled about them. Go figure. After last month’s journal expedition, I wandered through my bookshelf and discovered a journal wherein I reviewed books for myself as a reminder of what I read and what I thought. I forgot I had done that. My inspiration came from those funky “record your recollections” books found in your bookstore’s gift section. The fun titles and decorative covers invite you to review wines, where you drank them and save the wine labels. You could write about the places you traveled and significant snippets of the journey. Journal titles encouraged memories of meals and restaurants, favorite songs, meaningful quotes, garden plantings, lists and more. Since my two main interests were books and movies, I decided I would chronicle my impressions of each. Rather than pay for a fancy-schmancy, pretentious book with pages too small for a proper review, I could make my own book better than any preprinted book. 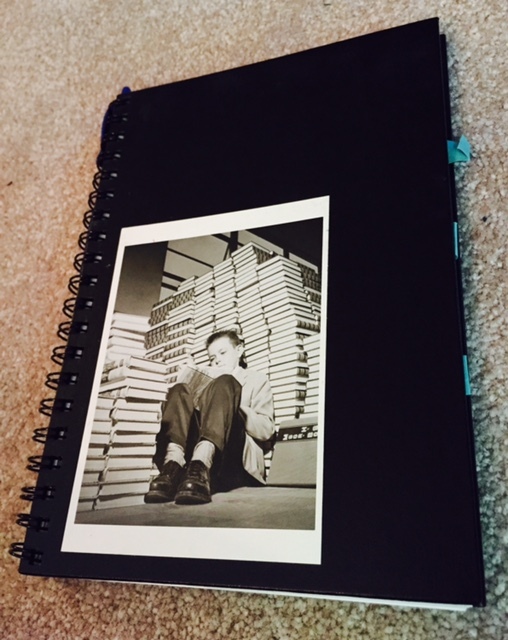 Besides, I found a pair of regal spiral bound notebooks, elegant in their 8″x10″ stature. The simple black hardcover was perfect for a funky, relevant, inspirational postcard. I clipped identical, important-looking blue gel pens in the rings. I was set to write whether at home or on-the-go. I recorded each book in the same look, manner, and design: “The Title” by Author; Month and year I finished reading, and my review. It was the prehistoric equivalent of modern day Goodreads. I tabbed four sections. The front main pages were reviews of the books I read. The second tabbed section I reserved for books recommended to me or that I wanted to read. The last section has some pencil scribblings on the first page; it looks like I planned a “books I borrowed or loaned.” I didn’t know enough people who read books. There is a third section tabbed off but with nothing written on those pages I have no clue what I intended. That book was my first exposure to self-published books, often called vanity press back then. This book had to be good. After all, it was a hardback book, with a colorful cover, I discovered at an independent book fair in New York City. That gave it validation. Ever since I read it, this is the book I refer to anytime I need an example of poor writing and the desperate need for an editor. Good advice to remember as I finish my memoir. As of this writing, I have not yet seen the movie. I wrote about the Harry Potter series from December 1999 to 2002. Interesting how my opinion has changed since those initial readings. I never did read that book again, but maybe I will now, especially since I am married. One part of my New Year’s Non-Resolutions is to revisit and reread an old favorite book. I’m faced with a dilemma: which one do I choose? Do you have any recommendations of good books to read, or ones to avoid? My reading logs began after I read a book about brain skills for my aging parents called Mozart Brain and the Fighter Pilot’s: Unleashing Your Brain’s Potential. The author suggested comparing your notes from the past with the present reading. Intriguing. Makes sense; the more I played with my Nintendo DS “Brain Age” game years ago, the quicker I was to add a list of numbers. 🙂 Go figure. I’ve also recorded the titles, authors, and a short review of the books I’ve read. Some of my favorite books not previously mentioned in my blog are “Dust” by Charles Pellegrino, “Flashpoint” by Lynn Hightower, and “Three Graves Full” by Jamie Mason, because they took stories in a direction that I didn’t expect. I love books that don’t give you the Hollywood Ending. I like to wander an writer’s creativity. One of my favorite books is Something Wicked This Way Comes by Ray Bradbury. I’ve read it several times and whenever I’m looking for an example of some aspect of what good writing is, I can always find one in this book.